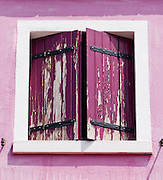 View Tom Dempsey's photos of Murano, Burano, and Torcello islands in the Venice Lagoon, Italy, Europe. 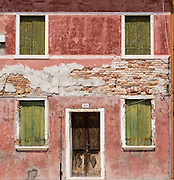 The colorfully painted houses of Burano are Tom's favorite photographic subjects in the Venice Lagoon. In 1291 AD, to avoid risk of fire, all Venice glassmakers were forced to move to Murano island, which has become a world renowned center for glass making and lampworking (modern torchworking). The Church of Santa Fosca dates from the 1000s AD on Torcello island. Barbarian invasions, such as Huns in 452 AD, drove mainland Veniti people to settle the islands such as Torcello, whose population peaked in the 900s AD with more people than the city of Venice. The Republic of Venice was a major maritime power during the Middle Ages and Renaissance, a staging area for the Crusades, and a major center of art and commerce (silk, grain and spice trade) from the 1200s to 1600s.